There are a lot of things that will help spruce up your interior space. 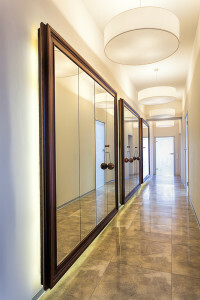 In a commercial property, you should consider a custom mirror. The following are a few ways a custom mirror can improve your interior. Whether you have a small interior space you want to enlarge or a large space you want to make even larger, a mirror definitely does the trick. Placed opposite from a doorway, the mirror will reflect the room it is in, as well as the hallway or room it is adjacent to. This provides the illusion of a much larger space. Placing a mirror opposite a window also enlarges the space, giving the illusion of even more natural light into the room. Whether the custom mirror is hung over a fireplace, a piano or another main feature in a room, it draws attention to the feature, complementing it. It counters the visual weight of the feature, opening the space above it, but with the right frame surrounding the mirror, it completes the entire look. If you’ve ever spent some time in a luxury hotel, you may have noticed mirrors surrounding the vanity, the closet, the entryway, and other areas. Two long mirrors on either side of a wardrobe, from ceiling to floor, open it up to feel spacious for when you change. Custom vanity with mirrors as the countertop gives you a luxurious area to get ready for the day. Large features, such as a stairway or chandelier, are made more beautiful with a reflection that extends them. A custom mirror at the bottom or top of a stairway expands the visual space. A chandelier hung on a ceiling mirror visually expands the chandelier to make it a grander statement piece. As you can see, there is a lot that can be done to an interior space using a custom mirror. To learn more, contact Horizon Glass today by calling 303-835-4399.